The Ostrich, Struthio Camelus, is a universally recognised bird. It was fashionable to wear hats and dresses made from ostrich plumes, especially during the colonial era. 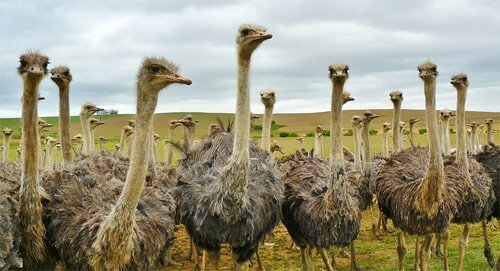 Large numbers of ostriches were exported to places all over the world, and, as a result, the ostrich is well known. For those who believe in a low-fat diet, ostrich meat is a great substitute for chicken. The Ostrich is the world’s largest flightless bird. Consequently it is potential prey for the big cats. It lives in open, dry areas where it can locate predators. It is able to run at about 60km/h and its stamina is legendary. The males are mainly black while the females are a drab brown. As a result the males incubate the eggs at night which is unusual in the bird world. Towards Spring the male bird’s testosterone levels increase and they can be quite dangerous. Remarkably the ostrich has only two toes per foot, but the front toe is a lethal weapon as the ostrich’s main defence is its kick. Some 23 years ago, Viva Safaris owned the piece of land across the road from Tremisana. I recall riding a three wheeler when, in full view of my four then-teenage children, an ostrich male chased me for over 120 metres. I landed up in a thorn bush which made the spectacle all the more hilarious for my ill-mannered and badly-educated offspring. I have since learned to examine the front legs of any male ostrich I may see in the bush. If these are a bright pink, then I run like mad ( as best I can ) in the opposite direction !! These are birds not to be trifled with !!! As always, presented in the exact order I receive them. We are having wonderful game drives because of the good rain that we received – the bush is an amazing green. On one of my Sundowner Drives we had a huge herd of elephants surrounding our open Cruiser – it was an amazing experience for my excited guests. On an Afternoon Drive we had only seen impala, kudu zebra and giraffe. 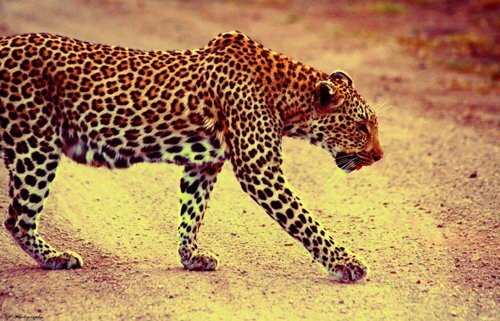 We drove down Sable road where we saw a leopard. One of my guests was so emotional and so very happy that she started crying !!! Wow !!! It was so great to see people enjoying our nature. On a Bush Walk accompanied by Shannon, we saw hippos and crocodiles. We then heard an elephant breaking branches. We tracked him ( the wind was favourable ) and it was amazing to see an elephant bull so close on foot. On a Sunset Drive we saw impalas – they are everywhere – as well as giraffe, waterbuck, kudu, zebra and Black Rhino. When we reached Marula Boma for the tasty BBQ we saw a honey badger and a civet. While we were eating, a bull elephant came around – he was in musth – full of testosterone – we could smell him from a distance. But he was cool although my guests were very, very scared! I got a good photo of a lioness right close up to my Landcruiser – guests were very impressed ! It has been one amazing month on both drives and walks! We have had sightings ranging from beautiful birds to amazing sightings of big five as well as general game. We have been privileged enough to have nice close encounters as well as seeing some action in the bush when I spotted a herd of Impala busy alarm-calling on the Rome 1 property and managed to see a male leopard attempting a kill on my Sundowner drive. From quiet drives of just a few Impala and Zebra right through to having two of the Machaton Male Pride lions walking down the road on Campfire followed up by a breath-taking sighting of three Black Rhino on Ezulwini. Truly worth waking up for as well as watching the sunrise from a red / orange peak to a bright ball of light shining down on us. Two lions of the Machaton pride. An excellent way of getting some exercise and getting the opportunity to become one with nature while beating about the bush. From medicinal uses of the different trees in the area and traditional beliefs to being able to watch the Hippos in the Olifants river, I have learned a lot on the walks with my Senior Guides and I can’t wait to use their knowledge on my own when I further my qualifications. We enjoy seeing the joy and laughs the walk brings to our guest and makes it nothing but a pleasure to be able to share the experience with them. I have had a brilliant month on the afternoon drives as I spotted Elephant, Rhino and Lion as well as excellent general game sightings of zebra, giraffe and other antelope species. I have put a lot more focus onto my bird sightings as I have had many guests showing an interest in the vast variety of species we have in the area – this has helped my knowledge and interest grow. Nothing beats parking on a beautiful in the bush spot to view the sunset while being surrounded by the animals of the African Bushveld. Elephant! Breeding herds, bachelor herds and single bulls. Male Lion and Female Lions, Leopard hunting and Rhino – white rhino bull as well as black rhino bull, cow and calf. It is an amazing drive and really makes the experience unforgettable. Great sightings and then having a beautiful dinner under the stars around one of Africa’s Spirit Trees – the Marula Tree. Even if the game drive was quiet there is always a surprise waiting for us at the Boma, from Honey badgers, Porcupines, Elephant and Spotted Hyena. What a great way to welcome our international guests to a true African Experience !!! 3rd April : Kruger full day drive, it was a raining – sightings difficult, lions on s100, elephants also on s100 and more on Sweni road, buffalos at Welverdiend waterhole. 7th : Better day : lions on h7, hyenas on s36, wild dogs h7 before s12 Girivana turn off, elephants Nsemani dam, two dagga boys (2 buffalos old bulls) crossing at Nsemani dam to drink. 12th : Lions on Rabelais road s106. Wild dogs near Satara, Hyenas at their den on s36, buffalos Ximangwanini dam and elephants and plenty general game on Sweni road, two white rhinos crossing road near Orpen. 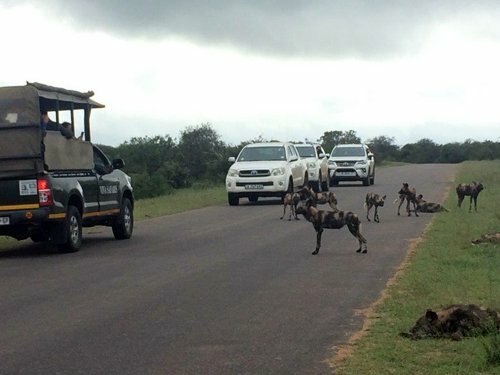 18th : Wild dogs on the road near Kingfisherspruit, female lion crossing at Phelwane bridge, buffalos Timbavati river bed, many elephants Nsemani dam. a big male leopard crossing road in front of us near Tamboti camp – that one was one beautiful sighting !!!! Patrick and lucky guests near Wild Dogs. 26th : Lions at Kumana dam. Elephants Sweni road, buffalos t junction s36 and h7, White Rhino near Orpen. 28th : Buffaloes as we entered at the first boom gate, elephants h7, lions s125 road near Kumana dam, beautiful secretary bird crossing before Nwanetsi bridge, more elephants Nsemani dam. April has been an incredible month, we’ve been very lucky, because we had late rain, the bush is still green, it has become thicker to walk and see but it is truly amazing to see the change of vegetation and the balance of our sightings. Mother Nature has truly an amazing strength and power. Shannon and I went on a morning drive, so what a surprise it was when she found 2 male lions and radio called me into the sighting. Our guests were thrilled but had two wishes for animal not seen yet : Rhino and Leopard. This said, we got an amazing updates, one of the guide from another company we work with, called us and told us about an amazing rhino sighting. I didn’t think twice and I turned around and reached the sighting pronto. As we got there, it turned out it wasn’t 2 but 3 black rhinos, they were making their way to the road, I positioned myself and stopped and we waited for them to cross. They crossed in a very peaceful way. It was mind-blowing !! 4h45 am, I was up at the coffee area (LAPA) when I heard this very loud roar. Elias came not long after that sound, we we’re waiting for our guests patiently but really wanted to go out. 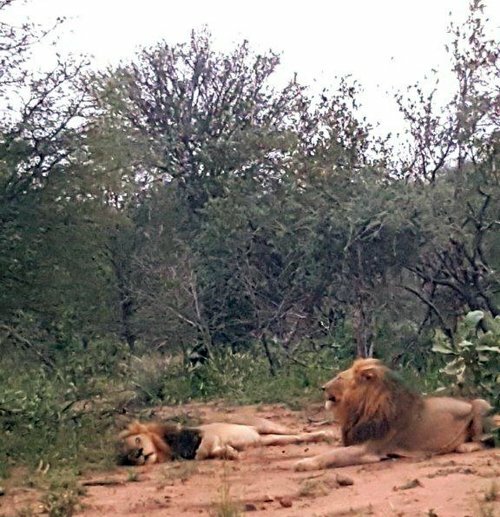 We went out and 600 meters down on Olifants road from our lodge, there were 2 male lions accompany by 3 females, they stood up and walked further in the bush. 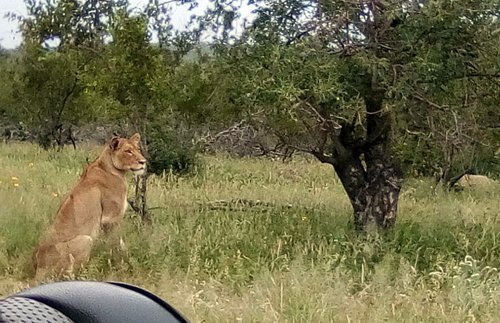 We then headed off to Marula Road to find yet another female lion. This one was alone and hungry, and she was focusing on the impalas nearby. It was very quiet and all of a sudden we heard the tiniest little call of a lion cub. It then all of a sudden made complete sense of why and how this female was here alone. One afternoon, I had some wonderful ladies and we went out, chitchatting and looking for some wildlife. We made our way towards Rome 1- we found some Zebras, the one stallion was even posing for us, he had his front legs on top of an old termite mount, it almost looked like he was on a throne. He waited patiently for us to be done with our pictures then moved off. A little bit further we found a tower of giraffes, we stood there for a good half an hour, just enjoying these giants moving in front of us, chewing some leaves and the 2 youngsters kept on being curious, came closer and then moved back, a little closer and then back again. We had such a great unbelievably learning time with them. On a warm afternoon, the cooler box was packed with drinks and my guests and I were excited to see what would the drive bring us. It turned out to be really quiet for a while. Then as soon as it got cooler, we were driving toward our sundowner spot, when I saw a couple of vehicles from a distance. We made our way closer and had a sighting of a male and a female lion mating and it happened right in front of our Cruiser. It was truly special. I went out with a lot of hope and, as we started our drive there were some giraffes on Tremisana property. We viewed them and then found some impalas as usual, but he took us some time before we got to see a big herd with the females and last year’s little ones. A guide working for another company told us about some elephants at Campfire dam. Since the drive has been fairly quiet until then, I decided to take a chance – we headed towards Campfire dam and what a surprise, we found ourselves surrounded by elephants in the moonlight – it was just magical. After the usual great BBQ at Marula Boma, we spotted 3 small spotted genets – one of them was really beautifully visible, lying down in the middle of a big tree with no leaves surrounding her. Further on we managed to find a massive Chameleon in one of the Red Bushwillows. I can’t wait to see what this next month is going to offer…. We have had great sightings of lions this month with 3 big male lions along with one female and her 3 cubs on the Barnard property. There have been daily sightings of a school of 10 hippos with 2 babies in the Olifants river. Elephants have been plentiful. Crocodiles are appearing later as it is getting colder. After the rains and the growth of grass, the zebras have returned to join the herds of impala, kudu and giraffe that are always here. 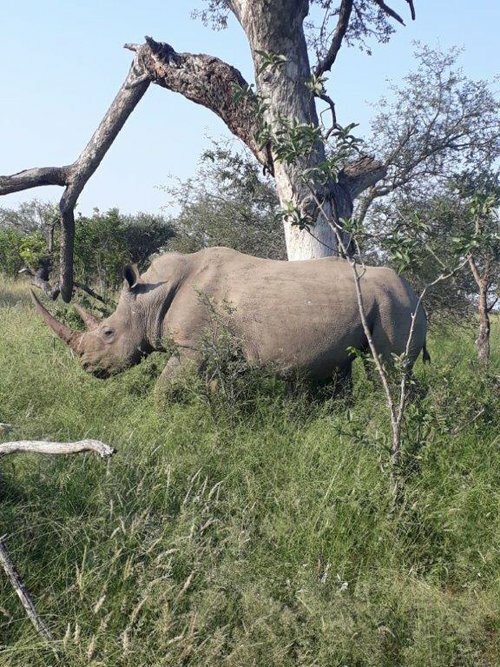 We saw on one afternoon drive 4 black rhinos, 3 giraffes on the Olifants roads very close to the Nonwane cutline, and finally we saw 2 bull elephants on Barnard. And then, wonderful news : 3 bull buffaloes towards Tremisana – the first buffalo sighting for months – I know that the guests always see them in Kruger but we were feeling left out!!! On one drive, we found 1 female black rhino with her calf, then the luck got a hold of us and we found a beautiful male leopard on Rome 1 and eventually a herd of elephants that were busy eating near the Spruit. We then found 6 wildebeest and 4 zebras on the Barnard Airstrip. On one drive, we started with a great sighting of 2 white rhinos, some giraffes and zebras and then an elephant in the middle of the road. Good shot of White Rhino on the move. We then found 4 bull elephants at the Campfire dams and 1 black rhino with a calf and we saw the legendary 3 legged hyena at Marula Boma along with some jackals. We were happy to see Three Legs as we haven’t see her for two months ! The river walk is still one of the most special things to do as no other lodges do it. Sightings of hippo, crocodiles and animals along the river is always special. Love every moment – it is great to see the sun come up and enjoy freshness of the Autumn bush. Most times cats are still active. I am now fully qualified to conduct safaris in Kruger and wow, wow and wow : Kruger has been so awesome with all antelope species right at the roadside and elephants all over. Cat sightings haven’t been easy as the grass is high – looking so good and great for animals. 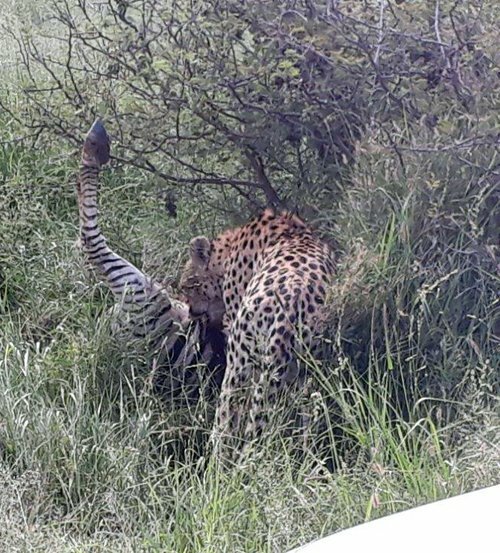 Highlight this month for me was a cheetah pulling down a young zebra. We headed out on the H1-3 and came across a buffalo herd first – wow – some Big bulls in there. They were grazing slowly through the grass. We continued and found a bachelor Elephant which came out of a mud wallow. Really relaxed. Further along the river we saw a crocodile sunbathing in the winter sun to heat up and a troop of baboons roaming through the dry river bed playing around. We also saw loads of Blue Wildebeest. Some more elephants but this time a breeding herd of 200 elephants breaking branches in front of and next to us ! Continuing on for about 4km down the road we come across another breeding herd of elephants but even bigger than the previous herd this time about 300 elephants easily – even I was surprised seeing so many elephants already but still magnificent viewing them. We had a really irritated bull when a part of the herd crossed the road he showed his big ears to us and stood there viewing us – the guests knew they were in safe hands. He eventually decided to move across as he saw we were not a threat to him – wow – what amazing behaviour. We continued to Nsemani dam where we saw Crocodile and Hippos relaxing in the sun..
Down the road we came across the endangered Southern ground hornbill. After lunch we went down south to the S126 where we found 2 male lions. They were really relaxed and were lying on their backs with their legs in the air. We then found another big herd of buffalo at a mud wallow. On the way back to the Orpen gate we saw all the general game. The sun was starting to set slowly bringing that fiery colours out great photo time with the lighting. Just in front of the gate we viewed 6 white rhinos grazing about 150 m off into the bush. Wow – they were walking slowly away making it a sighting of 10 min but with the sky it made it amazing. As the sun was setting, we stopped to take some amazing pictures. Then one of the Kruger Park staff members stopped next to us and told me that there was a young female leopard in front of the first boom gate. Brilliant close up shot of leopard. That was another month coming to an end and really looking forward to next month to see what Mother Nature has in store for us. Be sure to read my awesome travels next month. 3rd April : At Tremisana lodge 7 lions with a 2 month old cub were feasting on a zebra, just south of Tremisana Dam. Lions on zebra kill at Tremisana. 9th : Ezulwini, our biggest tusker, came really close – about 3 metres. He is so relaxed. 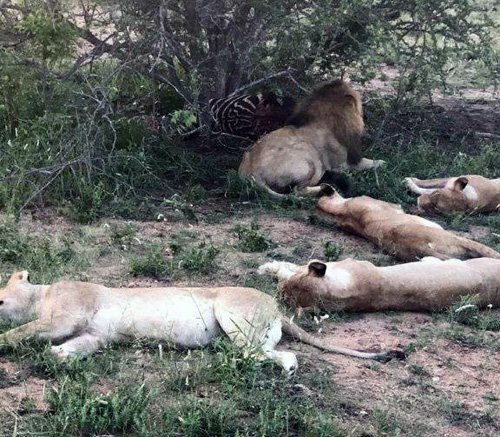 17th : In Kruger on S147 we found a pride of 14 lions on a kudu bull about 15m from the road. 19th : I had some guests who were on the SleepOut safari package and we did an afternoon walk. On Rome 1 we found the spoor of a white rhino – we tracked him and found him. 26th : Another afternoon walk with SleepOut guests. We found 4 white rhino, an elephant and a buffalo. We approached the elephant and the white rhino but the buffalo looked very uneasy so we gave him a very wide berth. After the hectic April Easter weekend, all our lodges experienced a quieter time and we have been able to get a lot of “lodge” work done. Under Head Guide Andy’s direction, we have opened new roads at Tremisana and at Marula Boma. This will help in adding a few more kilometres for our game drives. We have built a new shower for use by guests doing the 4 day SleepOut safari. The Koi donated by Patti have been gobbled up by a hungry Hamerkop ! Perhaps they were too colourful as the Tilapia seem to have survived. Tremisana Dam is still over 80% full. This is remarkable as the dams on the nearby properties are close to empty. Notwithstanding the use of the solar panel operated borehole to supply water, Tremisana dam’s catchment received a lot of rain and we look forward to some great game viewing around the dam and the lodge in the forthcoming dry season. The grass cover is fairly good. Katekani has been relatively quiet – we suspect that most of our tourists are choosing the more affordable options we offer. This has given us a chance to get things done and the lodge is looking good. The Nyala and Impala seem to be getting tamer. Marc’s has been relatively busy and our staff have worked hard at maintenance. The main lodge roof is in the throes of being re-thatched and all the wooden poles and balustrades of all the treehouses are getting a coat of creosote. We have replaced tent 1. The buffalo herd is moving around the property and we are seeing them frequently on our morning bush walks along the Klaserie River. We have heard that the water crisis in Cape Town has had an effect on tourism there as well as in SA in general. The recent rains may change this situation and, as the Cape Town region gets winter rain, we are holding thumbs ! Thankfully our safaris are generally affordable and we have not experienced the drop in numbers that we are hearing about with other operators and in other lodges that are more costly. We shall have our 2019 tariffs ready by month end and I shall see to it that these are sent to you and added to our website. It is always a challenge to factor in unknowns such as fuel price increases, electricity tariff increases as well as food inflation. These factors play a significant part in the determination of our tariffs. Our plan has always been and continues to be to offer affordable safaris that live up to our motto that Viva offers the “ best value-for-money “ safaris to Kruger Park. The Catholic Volunteers Africa project is off to a slow start but we now have printed 10 000 brochures which we intend to send to Catholic dioceses worldwide. It is certainly not limited to Catholic organisations but we thought this was a good starting place as the beneficiary of our outreach program is the Catholic parish of Acornhoek. Over 60% of our staff hail from Acornhoek so it is fitting that we put back something into this region. Please take a look at www.catholicvolunteersafrica.com for further details. Should you wish to see our brochure, please let me know and I shall gladly post this to you. Stayed in August 2007. We were on the first part of our honeymoon. Tremisana was excellent. A very affordable quality safari lodge. We stayed for 4 nights with a trip at dusk the first night searching nearby for wildlife. Our room was near the pool and that first night the elephants came and dug up the water pipe on the other side of the fence about 10 feet from where we slept. Two days were spent in Kruger Park were we saw nearly everything including quite close to a family of Rhinos. The male Rhino was thinking of charging our jeep just as we drove off. 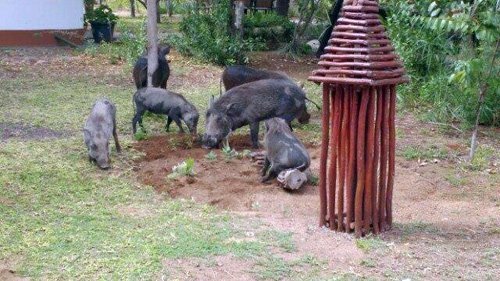 Also visited the rescue centre at Moholoholo were we culd get up close to the wildlife. Final we spent three hours on a bushwalk in Kruger with 2 guides. The service and food was delicious especially the soups and bread. The owners and staff are helpful and chatty. I would highly recomnend Tremisana and hope to return there. Joe Hehir. Atmosphere and staff top notch! We had an unforgettable stay in this amazing place! The owner so friendly and welcoming, and the whole place like taken out of a jungle fairytale! Basic rooms/bungalows, but the atmosphere is fantastic and we loved our stay! Viva Safaris exceeded my expectations in terms of friendliness, great customer service and being a well-organised 3 night safari. The email communications to confirm booking and arrangements was great. The staff were able to answer any queries I had via email and a staff member was able to pick us up and drop us off at Hoedspruit airport. 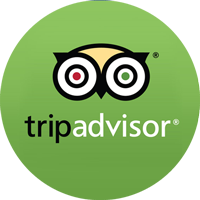 The food was delicious and plentiful, the accommodation was basic, but sufficient and clean. The guides were very friendly and knowledgeable about the animals on our safaris and went out of their way to ensure we got to see some of the Big 5. The drives and walks always left on time and the days were well-planned. One of the guides, Andy, even went out of his way to go to Hoedspruit Airport after we’d left South Africa to check if a mobile phone had been handed in. I would highly recommend Viva Safaris for an affordable experience in the Kruger National Park.